Jeff Solomon will give a lecture in DeTamble Auditorium at 4:30 p.m. on October 23 about his new book, So Famous and So Gay: The Fabulous Potency of Truman Capote and Gertrude Stein, which was released by the University of Minnesota Press in 2017. 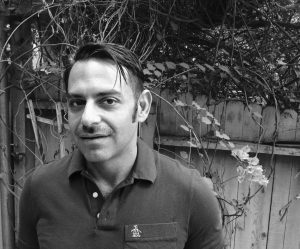 Professor Solomon is a newly appointed assistant professor of English and Women’s, Gender, and Sexuality Studies, so this lecture is a chance for the larger community to celebrate his scholarly achievement and find out more about him! This talk is part of the Women’s, Gender, and Sexuality Studies Colloquium series, organized by Melissa Jenkins (English) and Paige Meltzer (Director of the Women’s Center). 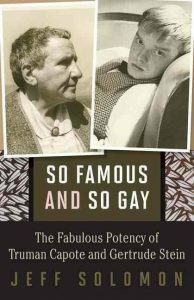 Seeking to understand how Gertrude Stein and Truman Capote became mass-market celebrities while other gay public figures were censored, Jeff Solomon traces the construction and impact of the writers’ public personae from a gay-affirmative perspective. He historically situates archival material to explain how the writers expressed homosexuality and negotiated homophobia through the fleeting depiction of what could not be directly written.